Yogesh Chabria - The Happionaire ​Blog - Best Motivational Speakers In India - Inspiration, Success: The True Meaning Of Diwali! The True Meaning Of Diwali! I wish each one of you a very Happionaire Diwali and a New Year filled with smiles, Saraswati and Laxmi. Let us all celebrate, be happy and share our life with friends, family and loved ones. I would also like to thank all those of you who sent me such lovely Diwali greetings. It becomes very difficult to reply to all e-mails, but reading them puts a big smile on my face and this is my reply to all of them. I noticed that a lot of you have been spreading the message of an environmentally friendly Diwali. This is very nice. A Diwali with less smoke and noise, and lovely diyas and lights is so beautiful. The message is already spreading and I have noticed that this year fewer people are burning noisy and pollutant fire crackers. The same money can be used for better purposes and can be used to bring smiles to people around us, who might not be as fortunate as us. When you look around you, will realize how fortunate you really are. It is also a great time for all of us to realize that our happiness, life and well being should not be dependent and hostage to where the stock markets are headed or where the economy is headed because we are much more important than anything else. To all my fellow Happionaires who might be getting worried about job losses, economic slow down, a portfolio in deep red and a shortage of cash – please don’t be worried and smile. This life is wonderful and every such phase gives us a chance to start afresh. It is much better to smile and be happy, and not get too worried – because it never helps to get too worried. Getting worried and depressed will never help you. There is a supreme and divine force that takes care of us. Right from the king living in the mansion to the man selling kulfi on the road to the poor man sleeping on the street – there is someone that takes care of us as long as we believe and trust in that force. Different people might give it different names- God, Krishna, Allah, Jesus, Ram, Buddha, etc. but I believe they are all one and the same. In our lives we will all have ups and downs. Life is a lot like kindergarten. We will all have times when we win the race and times when we fall badly and get bruised and cry and go home to Mama or Papa. And then as soon as they hug us everything is alright and we smile and get back to being mischievous and playful. A few of us might get bruised now, but let me reassure you that once you get up and run again, a few years down the line you will look back and tell yourself that you were very lucky to have gotten up and run the race again. Stop worrying about the short term slowdown and quarter to quarter results, most Indian companies are still very profitable and I still have full faith in our wonderful people, country and economy. In the future markets will be higher, people will be richer and your personal portfolio will grow if you stay calm, balance and make sure you never stop learning. More wealth doesn’t get created by worrying, panicking and getting depressed. If you are smiling, happy and enjoying yourself, ideas and wealth will come to you. Goddess Laxmi will come to all our homes and we need to make sure we are all smiling and ready to welcome her with open arms. Nobody likes to visit a home, where people are not smiling and not welcoming. Diwali is all about new beginnings and making sure our spirit of living, smiling, trying and succeeding always lives on. Thousands of years ago, whenever people would have tough times and there was darkness everywhere, people sat together and lit diyas. These diyas bought light and smiles to faces of people. Our culture has always been about hope, living and being happy. Twenty years ago none of us had cell phones, laptops, cars and all the comforts we have today, and still I remember we would smile, eat mithai and enjoy life that time. And never make the mistake of judging yourself based on how much money you have. Never let money be the most important thing in your life and never let it be the one that decides whether you are happy or sad. Once you take control of what makes you happy, you can also control money. Aaj to jiine ki tamana hai…aur sirf jiine ka irada hai. Spread the love, smiles and warmth everywhere. And please be extra generous with the people who work for you. The more your give – the more you get. Make them smile and a lot of good will happen! Let us celebrate our tradition, culture and way of life and make sure we have a world filled with Happionaires! Wish your fellow Happionaires for Diwali in our comments section and share the joy. Wish you a very Happy Diwali too! And lovely words, they made me smile and motivated me. A very happionaire Diwali to all the family members and hope the best for all people in markets. Please let us try to be there for people as sadly some people are committing suicide. Our brothers and sisters need us and we should try to spread the most important message of being Happionaire and not making our value related to money we make. Most important words for our genration today. Your post brightens up the otherwise sagging mood of the Investor in the Stock Market. It is only in these times that one learns that your portfolio value is not the end in itself. Let the true meaning of wealth and happiness dawn on the several readers of your blog and my wishes to you and all Happionaires on the occasion of Diwali! Agreed 100% Gopi. This is the time to know that true wealth is our health, happiness and loved ones. I'm lookign forward to reading many such beautiful thoughts and ideas from you Yogesh and all other happionaires here. My love goes out to all fellow Happionaires and Indians here this Diwali. Light the diyas of love, knowledge and happiness everywhere. Continue spreading the knowledge much needed financial education for our nation Yogesh. Wish you a very happy & prosperous diwali & a very very happy birthday! May God bless you and you keep spreading smiles on the faces of millions of people. A very happy diwali to all the other happionaires as well! happy diwali to one & all. Well said sir ... heres wishing everyone a very Happy diwali and Prospereous New Year ahead, lets just hope and pray to god that going forward we dont see such "Gloom, Boom, Doom situation"
Very lovely words which can eb read over and over again to make me smile and feel nice. Looking forward to your next book too! May you always spread such lovely words and thoughts. 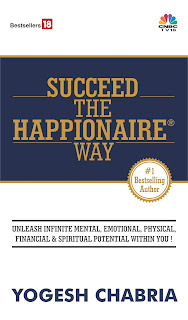 It was one of my life's most pleasurable reads this post and also the opportunity to read Invest The Happionaire Way. Your words have a lot of power and come out directly from your heart. I have not read much English, but this was very good read. I'm really looking forward to your next book of Happionaire. Please bring it fast for us. I'm sure yo uare much busy now but my best wishes go to you. It isn't at all about language Ajit and that is why so many people can learn from what Yogesh says about finance, investing and life. That is what is so appealing and attractive. I agree with you and this post made me smile. Kuldeep hume aapka hindi mein message bhi bahut acha laga. Glad this blog is going beyond languages. I got to know about your site and blog after reading Invest The Happionaire Way. To be honest i'm never been into finance, just read your book as my husband was reading it and it was at home. But as you already must be knowing since so many people have said, your way of explaining things is very nice and i can feel it coming from the heart. I'm sure one day everybody in our country will be a Happionaire the way you are spreading this message.